Have you ever had a Fairytale Brownie? They sent me some of their wonderful brownies to review. The first batch had been mangled, a UPS problem and not their fault, but they replaced them anyway. That was so cool of them! So, their customer service scored high with me right from the start. These brownies are decadent and creamy, rich and smooth little bites of pure bliss. I love a good brownie and these are the best packaged brownies I've ever eaten. I've tasted homemade brownies that don't even come close to these. My husband says I'm obsessed, but I prefer the phrase "in love". I believe what makes the brownies so extraordinary is the fact they are free of trans fats, hydrogenated oils, preservatives and artificial colors. You don't find that very often in a prepackaged treat. You can taste the flavors of the ingredients, not the artificial gunk and preservatives. This is a great change and makes for an exquisite brownie. 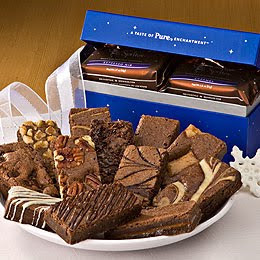 Fairytale Brownies would make an excellent gift this holiday season.Order by December 20, 2009 to guarantee you delivery by Christmas with standard shipping. I think it is great that you still have time to order. You can ship to friends and family across the country. Plus, they ship to APO/FPO addresses, something I really love about the company. They use the finest quality ingredients and guarantee your satisfaction. If you have a problem, they are going to fix it. Fairytale Brownies really stands behind their products and wants the customer to be 100% happy. So, if you are looking for a tasteful gift that will really be appreciated, go check out all the great gifts Fairytale Brownies has to offer. I am sure you will find the perfect gift for everyone on your list. They will thank you for it, I promise.